Keats's fine poem describes the awestruck wonder of Spanish adventurers as they first came in sight of the vast Pacific Ocean. Some band of early hominids, wandering far from their savannah homeland, must surely have felt a similar emotion as they saw the sea for the very first time. Here was a liquid, shining, alien element, utterly unlike their native earth - wide, wondrous and terrible. But mankind does not stand awestruck or terrified for very long. The hominids, hungry as ever, would soon have been scouring the seashore for food. And Cortez would have been wondering how he could navigate a ship around to load silver and gold. We can be sure that people have always sought food along the seashore, and fished as soon as they knew how. But they were not content with walking the sea's margin. We think that there must have been boats or rafts of some kind in use at least 50,000 years ago – and, in good time, there was marine art. The earliest representation of a boat we have dates back some 8,000 years. Ever since then, artists have been busy depicting boats and ships, fishes and whales, seashores and the ocean itself, whatever is on and beneath the surface of the sea. It is an inexhaustible source of inspiration. For centuries the medium of human dealings with the sea has been the ship. The sea, unknown and feared, was the dangerous element over which the world's trade was transported and national power was extended, but the ship was the creation that made it all possible. No wonder, then, that artists have always gloried in ships - sometimes viewing them as grandiose floating castles, sometimes as heroic vessels battling the storm, sometimes as passing beautiful visions in an empty seascape. On a harder note, that was what the customer wanted. Kings and admirals wanted their ships illustrated and their successful battles recorded. Shipping merchants wanted their favourite ships immortalised, and later, paintings and posters were needed to sell shipping lines to the public. Ships today usually lack the sharp beauty of clipper ships or the massive grandeur of the 1930s ocean liners, but they still make an inspirational subject for the artist. They still embody all the old magic of mankind's daring venture across the great waters. 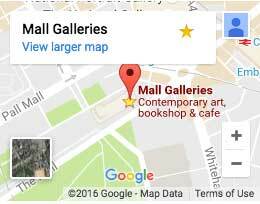 The arrival in 1673 of the Dutch painters, the father and son van de Veldes, brought specialist marine art to England. Their powerful example set the mould of British marine art for 100 years, culminating in the classical balance of such artists as Charles Brooking. The theatrical painter Philippe Loutherbourg broke this calm and made way for Turner's tempests and atmospheric golden veils. In the middle of the 19th century a breath of fresh air blew in with Thomas Somerscales, who brought new and naturalistic ways of painting the sea and ships' sails. The sea and seaside were recurrent themes in French Impressionism, but that movement had little influence in Britain. Instead, artists of the Newlyn School, led by Stanhope Forbes, founded a movement early in the 20th century concerned with social realism among the fishing communities of Cornwall. Their emphasis on strong drawing and painting skills survived through the first half of the century and beyond. There was a strong national interest in maritime affairs in the first third of the 20th century - deriving from a powerful Royal Navy, from the huge global importance of the British merchant marine, from an awareness of maritime heritage culminating in the preservation of HMS Victory and the Cutty Sark, from the great transatlantic passenger liners, and from yachting interests. All this supported a great deal of marine art and led to the foundation of the Society of Marine Artists (later the Royal Society of Marine Artists) in 1939. 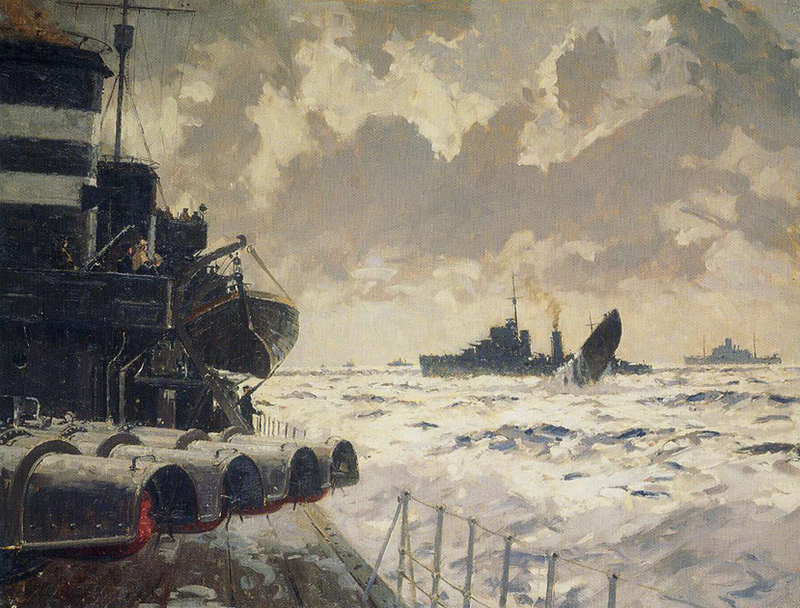 The war years were the subject of much marine art, notably by Norman Wilkinson. 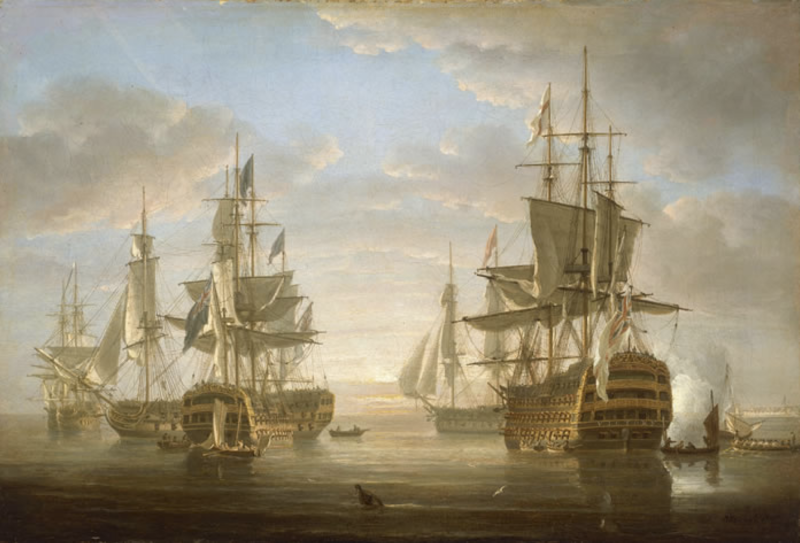 The traditional task of the marine artist was to portray ships framed by harbours, or the settings for sea-battles. But beginning in the mid-1800s new themes began to emerge as people had more freedom. They wanted recreation and fresh air and found these at the seaside - John Constable, for example, recorded the sea-bathing scene at Brighton. The sea started to be regarded as a playground. Sailing soon became a passion with the rich, and then with others less well-funded. This progression to our present-day leisure interest in the sea was punctuated by the two world wars, in both of which marine artists recorded the scene and served in other ways - Norman Wilkinson and Peter Scott, for example, developed warship camouflage schemes. Artists became fascinated by the great and dramatic subjects presented by heavy industry or, in the case of marine art, shipbuilding. As it moved into the 21st century, marine art concerned itself with ships and boats, of course, and beaches and harbours; with seas and storms, with fish and seabirds. Today the sea is a playground once more, home to many different sports. But it is also the focus of new learning as we dive below the surface into the element itself, to the reefs and deeps and what has been called inner space. Today's marine artists, and tomorrow's, will respond to the new understandings, new challenges, and new beauty of this amazing new world. Some artists make good sailors, and some sailors make good artists. In the age before photography, topographic drawing was an essential implement for the ship's master, who would often navigate using not charts, but pilot books illustrated with coastal views - frequently drawn by himself. Such practically useful drawing was a requirement for junior naval officers and a number of artists began their careers as sailors. Nicholas Pocock was the master of a merchant shipand made several Atlantic voyages. Other successful artists of the late 1700s, such as Thomas Buttersworth, served in Nelson's battlefleet. Artists have often gone to sea to record distant corners of the world, from William Hodges, who accompanied Captain Cook's second voyage into the uncharted Pacific, to Keith Shackleton, painting the seabirds and ice fields of the Arctic and Antarctic. The early years of the 20th century, when the square-rigged sailing ship seemed to be doomed, spurred several artists into experiencing the last Cape Horn voyages, for example Claude Muncaster. 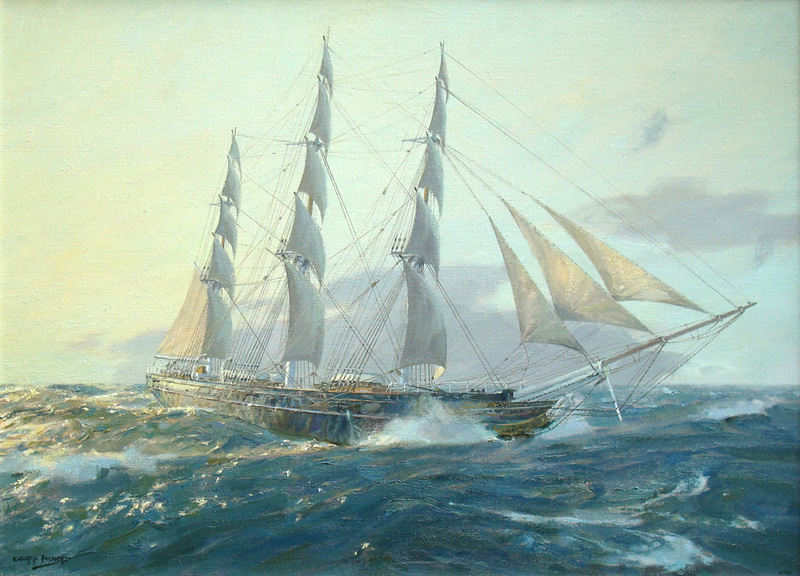 In the second half of the 20th century, marine artists who stacked up a great deal of sea-time have included Grenville Cottingham, with 100,000 miles in merchant ships; Mark Myers, serving aboard replica historic sailing vessels; Derek Gardner and John Webster, both officers in the Royal Navy; and Rowena Wright, a keen yachtswoman. 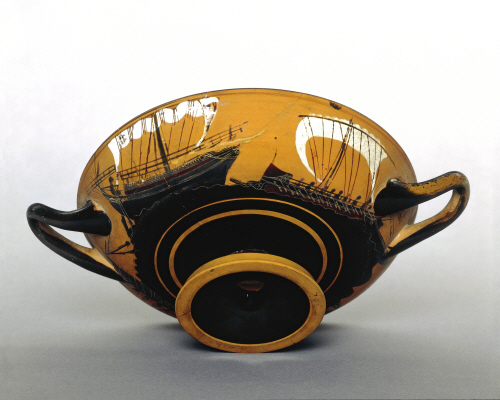 Vase, Black-figured kylix with scenes of a merchant vessal being attached by pirates. From Athens, Attic period, 520BC-500BC, © The Trustees of the British Museum. The Dutch fleet at anchor in a breeze, © National Maritime Museum, Greenwich, London. Norman Wilkinson, End of a U-Boat, © National Maritime Museum, Greenwich, London. 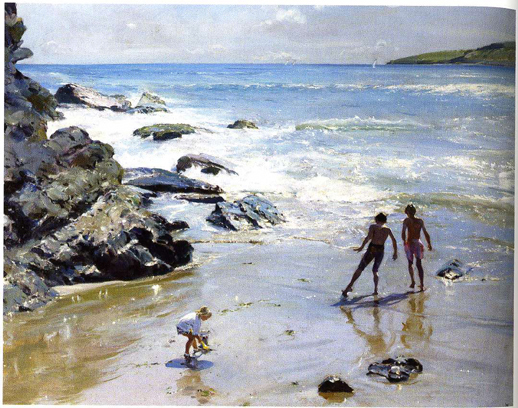 David Curtis, A Morning Swim, Porth Ceiriad, courtesy of the artist, © David Curtis. Nicholas Pocock, Nelson’s Flagships at Anchor, © National Maritime Museum, Greenwich, London. Keith Shackleton, Jan Mayen Island, © Keith Shackleton. Geoff Hunt, Cutty Sark in Wool Trade 1880’s, © Geoff Hunt.